Who, What, Why Local Joan? Come with your walking shoes on, your cameras loaded and your appetites ready. 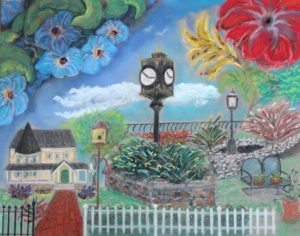 For the seventh year running, the Keyport GardenWalk will attract thousands of enthusiasts to the private and public gardens of this charming town on the southwest corner of the Raritan Bayshore. The event takes place over two days on June 2nd and 3rd from 11am to 3pm and is free to everyone. Visitors should give themselves plenty of time to browse the many dozens of gardens on display. A number of the gardeners of previous GardenWalks have cultivated their gardens once again for this annual event. Indeed, the annual preparation for this event marks the beginning of the gardening season for many of them. “We are nothing without our generous gardeners,” says Keyport GardenWalk chair, Clare Skeen. There are many gardeners who are willing to do so year after year and every year there are new resident gardeners who put their homes and gardens on display. The gardens that you will see vary from the sublime to the eclectic and the plants, shrubs and trees within them vary from indigenous to exotic. The resident gardeners are always willing to discuss their gardens with visitors and some welcome them with soft drinks, light fare and even some live music. The seed for the GardenWalk was planted 8 years ago when Ms. Skeen read an article about the GardenWalk in Buffalo, New York, in the June/July 2010 edition of Horticulture magazine. She then brought the concept to the Keyport Garden Club. From there, the Keyport GardenWalk started to grow from concept to reality. According to Skeen, the organizers of GardenWalk Buffalo “were very generous in their advice” to the Keyport Garden Club members that organized the event. In order to prepare and plan accordingly, the Club decided that the first GardenWalk in Keyport would be in 2012. Since then, the event has grown to be a top tourist attraction, attracting 3,100 visitors to the historic Borough of Keyport in 2017 alone. Visitors from as far as Dusselberg, Germany have previously visited the dozens of public and privately owned gardens as they walked, biked or took a complimentary pedicab ride through the picturesque borough which is scattered with Victorian-era homes and buildings that add to the charm and appeal of the day. In addition to walking the gardens, visitors can attend morning GardenTalks at Keyport Borough Hall on topics that include “Gardens of the Cotswolds – Inspirations and Lessons” presented by Kirsty Dougherty of Noble Garden Tours and local garden designer, Erin Koberle and “Backyard Birds and Beyond” presented by photographer and birder, Ed Norman. The day will go by quick, and you may not get through all of the gardens on in one day. 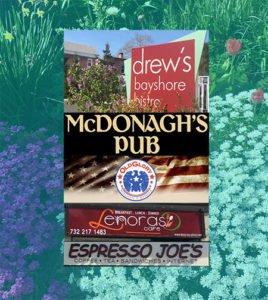 You can stay overnight at any of the local hotels, but don’t leave town without visiting one of Keyport’s renowned restaurants for a late lunch, dinner and a drink. Vendors from near and far have inquired if they could set up at the GardenWalk, but the response is always, “Thank you for your interest but we want visitors shopping in our year round shops and eating at our restaurants,” Skeen states. The organizers resolute to keep the interests of the local businesses and restaurants in town at the forefront. Local businesses and restaurants are “incredibly supportive of our Club and, in particular, this event,” Skeen adds. 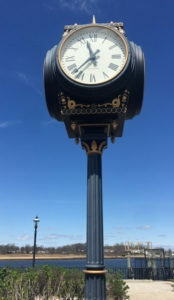 The Keyport GardenWalk is uniquely suited to provide a wonderful opportunity for visitors to support the local businesses in town. It attracts thousands of folks from near and far, and for that reason, Local Joan supports this event and gives it a grade A+. When you arrive at the Keyport GardenWalk event, be sure to make your way down to the Keyport waterfront gazebo – that is where the Keyport GardenWalk headquarters is. They will have all of the information you will need to start your tour of the gardens of Keyport. For information on planning your visit to Keyport on June 2nd and 3rd, you can visit the Keyport GardenWalk website which has directions, hotel information and general information about the Borough of Keyport. Espresso Joe’s – Great Music, Nice People, Awesome Food… Oh yeah, the coffee is fantastic, too!